Children will study a language at primary school, so give them a head start with this colourful book. It's excellent to see the book includes a link to Usborne Quicklinks where all the words can be heard. It's perfect for use with even the youngest child, with its friendly format. 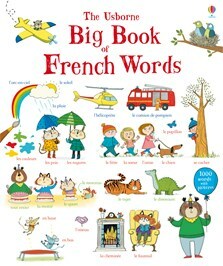 A fun and very educational reference book for school-age children who are starting to learn the French language... The combination of the simple to follow themes, well designed and beautifully illustrated pages really does make the book an ideal learning aid for any child starting out with French.